DIN size classic style chrome face CB radio loaded with state of the art features such as 7 Color Display, USB Charging Port, Beeping SWR Meter, Electret/Dynamic mic compatible and more. 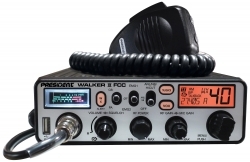 Naples, FL, March 19, 2019 --(PR.com)-- President Electronics, the worldwide leader of CB Radios announced today the launch of their newest CB radio - the "WALKER II FCC" arriving North America later this month. The DIN sized WALKER II FCC CB radio features a classic style chrome face, is Electret/Dynamic mic compatible, has a multi-function LCD 7 Color Display, USB Charging Port, Beeping SWR Meter, and much more. Retail is $159. The President brand is synonymous with advanced technology, quality, and prestige. As such, Consumers who also purchase a President antenna with a President radio, will get a full five year warranty on the purchase of their new radio. The full line of high end antennas, feature stainless steel, marine grade construction and comes with an unprecedented 10 year warranty.